Everyone wants to send, but figuring out precisely how—amidst the many training approaches out there—is challenging. However, what you should focus on is maximizing effort—in the appropriate way, relative to where you’re at on your project. I developed the above flow chart, with suggestions, to show you an easily customizable path to redpointing your hardest. If the above flowchart doesn&apos;t display properly on your device, view the full size image here. 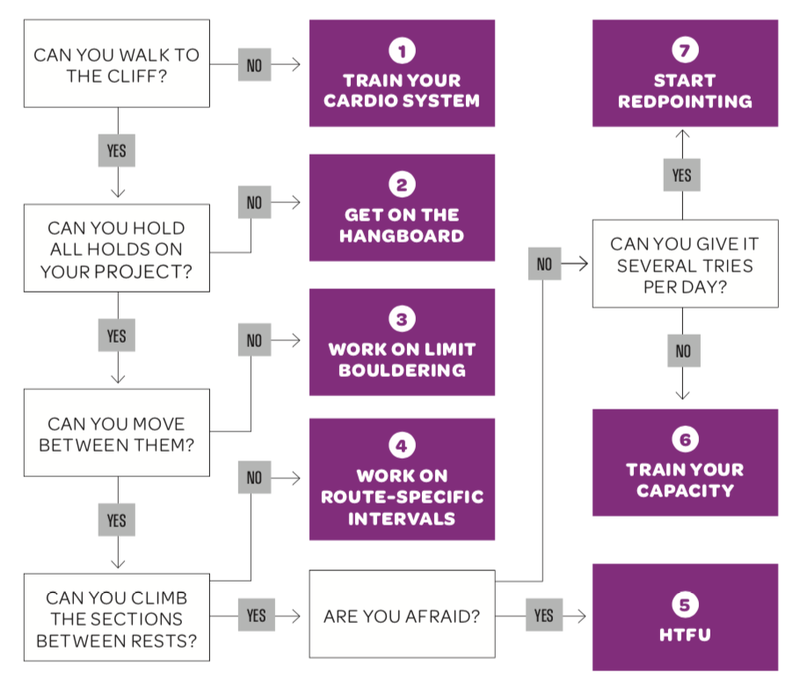 Most climbers have plenty of cardio capacity. However, if approaches wear you out, you might need basic conditioning—walking with a pack, hiking, or doing easy multi-pitch climbs. Aim for 30-plus minutes per day, every day. If you can’t hang the holds, get on a hangboard. Debating protocols is like arguing over which vegetable is better: Any vegetable is a good start. Figure out which holds challenge you, and train those. More work per session is not better; instead, do more sessions. If you can hang the holds but can’t do the moves, then limit bouldering is the key. Work supermaximal problems, trying two to three over a series of sessions. While sending is OK, focus on performing harder moves. Think of yourself as a musician trying to learn a difficult piece. If you can play it well during the first practice, you’re not really expanding your capabilities. Get redpoint-ready with The Art of Redpointing, an online course by pro climber Heather Weidner and mental-training expert Arno Ilgner. Unlock pro tips and world-class advice, including physical and psychological training techniques, becoming comfortable falling, linking sections, and overcoming frustration. Learn to embrace the process and climber harder and smarter than ever. Learn more here. Now that you can do the moves, the next step is linkage. Set up circuits that mimic the angle, style, and difficulty of your project. As you progress, keep the difficulty relatively equal to the various sections on the proj, and whittle away at the rest periods between them. Picture your outdoor project: First you hang on every bolt, then you link sections, and then you send. You’re slowly decreasing resting periods. Do the same with intervals. If you’re freaking out about being above your gear, stop. Letting fear run roughshod over you limits your options. We’re all afraid—it’s just whether we let it ruin us or not. You have a choice. Once you care more about sending than comfort, you’re set. Many climbers are incapable of trying a project-level route more than once or twice a day. This is unacceptable. You have limited years to climb, so maximize your time. If you lack capacity for several hard goes per day, back off for a month or two and focus on sending more sub-limit routes per session. Sure, 5.11c doesn’t thrill like 5.12a, but if you’re going to own a grade, you need a base. A typical capacity day addresses mileage near threshold. These are routes on which you try medium-hard (slightly above onsight level). Give three to five good redpoint efforts per day. Climbing just below your pump or anaerobic threshold will slowly increase the number of good goes per day on your project. No more excuses—it’s time get on the proj and give it your all. Steve Bechtel is the founder of the training website ClimbStrong.com, cofounder of the Performance Climbing Coach seminar series, and founder of Lander’s Elemental Performance + Fitness.